Interestingly, I’m publishing this post on the time when probably the whole World is riding on the wave of Google+; and, rather entertainingly I am well included in this World! 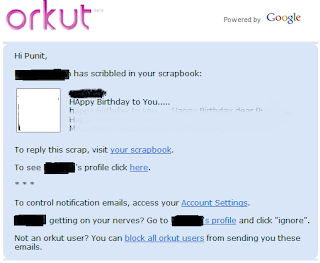 Months back, a realization occurred to me when an email popped up into my Inbox. 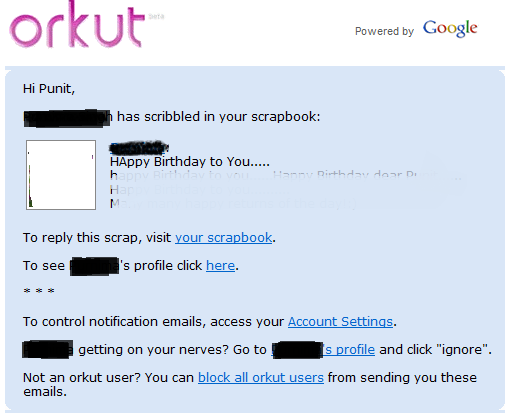 Subject: orkut - Mr X. has left you a new Scrap! Mr X.: You have received a scrap from your friend Mr X.
I was something, in some state that can’t be actually described by terms like amazed, shocked, shattered, sad etc. I wasn’t ready to understand what’s happening? Mr. X has been a very close mate, amongst my best friends, for last 5years; and on my best day what I received from him was just a Scrap, not even an SMS, call would have been a bounty! Yes, my friend had moved on to the new Social Life, i.e. social through cables, that uses Scraps, Testimonials, Messages, Likes and some absurd Poking, moving friends into Virtual Circles, etc to show their affection. I was born in a village, and brought up in a two-storey Quarters’ complex in a Government colony. My mom says we, I and my brother, used to spend most of our leisure time with our neighbors upstairs. I remember how friends were called up on birthday parties to devour the delicacy of puri-chole, dosa/idli-sambhar, chole-bhature and even kulfi prepared at home by mother and sisters. I still remember a few journeys I did in the General compartment of Indian Railways, in an environment full of smells – sweat, fried-peanuts, thekua, litti, baked corn and thousand other things! And, how can I forget spending time with friends, stealing jaamuns from someone’s tree, cricket in that small ground, feeding fishes at that pond, playing I spy (that we always knew as ice-pice) whenever it was an powercut. Now, alas, everything that was once part of everyday life is much readily available on the “Actual” Social Network. One can farm, feed fishes, play cricket, race on concrete, say Love you, like whatever is qualified (!) for liking, even I’ve been busy classifying my friends into virtual G+ Circle since last night only to realize the huge number of classified friends I’ve earned in last few years. But, ‘without touching, without being ‘actually’ together, without being traditionally social’! I don’t know what the future of Social Networking is, and I’m not that qualified on front to anticipate it. but, the thing I know is that whatever may become the size of one’s farm on Farmville, cereals will always be farmed in fields irrigated with hard sweat; howsoever Likes one gets on Status, a single Hello of a friend will always be unparalleled; whosoever pokes one on FB, a true friend would indeed be a friend in deed; whosoever write a testimonial, a real one will always be one who’ll stand by when needed; whatever may be the picture posted, best friendship will always be if it framed one and one’s friends! I love cherishing old memories with all I'm-not-able-to-meet-soon sort of friends, but talking to them in a while has its own flavour. Social Networking may live forever, being Social shouldn’t just be define on Network; but with the ones one is actually networked! Yeah, but haven you ever noticed how easy is to write/blog about these perhaps vicious cultures than to actually leave them.